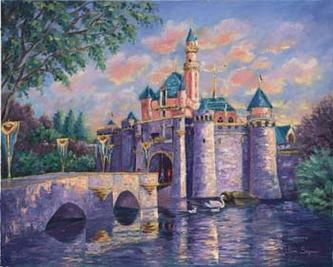 Actress and artist Jane Seymour will be on hand at Disneyland Park Sunday, December 2, 2007 from 10 AM – 12 noon for a special appearance and signing of her recently released painting of “Sleeping Beauty Castle” (shown here). Deluxe prints of the "Sleeping Beauty Castle" image and Jane Seymour’s latest book, Making Yourself at Home will be available as part of the product release & signing. For more information, and to view the event merchandise see the Disney Gallery Website. For more about Jane Seymour and her art visit JaneSeymour.com. See the Pop Life Art home page for links to the artwork of Jane Seymour and more than 100 other actors, singers, and musicians.